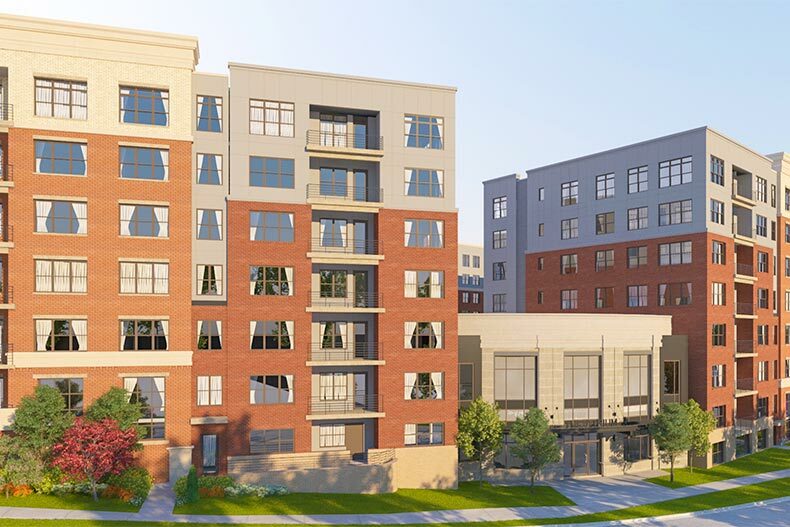 The Atrium at MetroWest will bring age-restricted condominiums to Fairfax, VA. In general, there aren’t that many 55+ communities in urban areas. Neighborhoods with age restrictions and the resort lifestyle usually don’t work in urban settings. But just like millennials, active adults want to be close to cultural life and places for recreation, with easy access to amenities and transportation. The Atrium at MetroWest, a new development in Fairfax, Virginia will give active adults that urban feel. The luxury condominiums are just steps away from the Vienna/Fairfax-George Mason University Metro station, and just minutes away from shopping and green space. Learn more about the new condominiums at The Atrium at MetroWest. Del Webb, a division of Pulte Homes and prominent builder of 55+ communities, announced in 2019 that they would begin developing The Atrium at MetroWest. Building on the success of Del Webb’s suburban developments with the benefits of urban living, this active adult condo building will include luxury homes with the amenities of a more traditional 55+ community. While the layouts and blueprints have not been finalized, the homes will feature open floor plans for easy entertaining and adaptable living space. The master bedroom will have an ensuite bathroom with an easy-access shower. The kitchens can be customized with granite countertops and stainless steel appliances. Like many larger communities with duplex and single-family homes, The Atrium at MetroWest will include social spaces where residents can get to know their neighbors. The clubhouse space will include meeting rooms, while outside residents can enjoy a garden and patio. The clubhouse will also have an indoor swimming pool and fitness room. The location of this community may be its best asset. Del Webb plans to build a pedestrian path from the Atrium to the Vienna Metro station. From here, the Orange Line can take residents to Falls Church, Arlington, and Washington, D.C. in a matter of minutes. This will definitely be one of the communities with the easiest commute into the city. Within walking distance, residents will also find two shopping centers with fast casual restaurants, big box stores, pharmacies, and grocery stores. Just a few minutes by car, and residents can explore the mall of Tysons Corner Center and Tysons Galleria. But it doesn’t just feel like suburbs and shopping malls. A string of parks connect to the Atrium, giving residents walking and biking paths to explore. The East Blake Lane Park has a paved walking and biking trail that leads to larger parks, with picnic areas, scenic creeks, and sports fields. And getting out of town is easy, too. Two of the area's airports are within a half-hour drive and residents can be on Interstate 66 in less than a minute. This community will be perfect for active adults looking for comfort, little maintenance, and an abundance of amentities. Homes will be priced in the mid $400s to low $600s. Those interested in The Atrium at MetroWest can request more information here.